Cross Laminated Timber (CLT) is made by laminating three or more timber layers with grain directions in alternate layers at right angles to each other. This structure, with its numerous wood bonds glued in cross-grained directions, develops residual stresses whenever panels are exposed to variations in temperature or moisture content. This paper analyzes how these residual stresses combined with mechanical stresses can cause CLT cracks by deriving an expression for energy released when a new crack forms within one layer. By using finite fracture mechanics concepts, where a crack forms when energy released by that crack exceeds the transverse toughness of wood, this equation can predict layer cracking under many conditions. Two specific examples given are cracking due to residual shrinkage alone and cracking due to uniaxial tension. Finite fracture mechanics and energy release calculations provide useful tools for designing durable CLT products and structures. 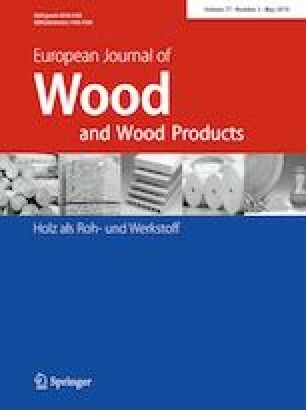 Various options for improving CLT are considered along with needs for more analysis and experiments. Two simple changes to CLT that could greatly enhance durability are to use thinner layers and to sufficiently dry the timber before panel fabrication. The online version of this article ( https://doi.org/10.1007/s00107-019-01399-7) contains supplementary material, which is available to authorized users. This work was made possible by the endowment for the Richardson Chair in Wood Science and Forest Products.